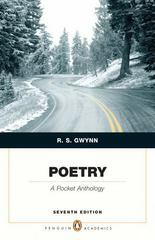 Poetry: A Pocket Anthology (Penguin Academics Series) 7 Edition A perfect alternative to massive poetry anthologies, this brief, affordable collection of over 250 poems provides a concise yet comprehensive introduction to the study of poetry. Authors new to this collection, including Amy Gerstler (named by the Los Angeles Times as “one of the best poets in the nation”), and award winners Rebecca Foust and Craig Arnold, provide ample evidence that poetry continues to flourish in today’s world. Young writers Ernest Hilbert and Erica Dawson bring poetry into the 21st century and provide inspiration for aspiring young poets.